Combining superb handling with strength, the pre-stretching process ensures optimum control for halyards. Specially designed for the dinghy sailor. 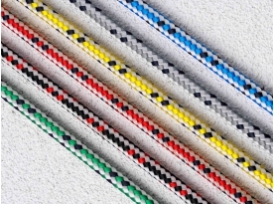 Sprintline is also ideal for control lines, leach lines, outhauls, lanyards and sailboards. Bright colours with contrasting flecks mean easy identification in use.